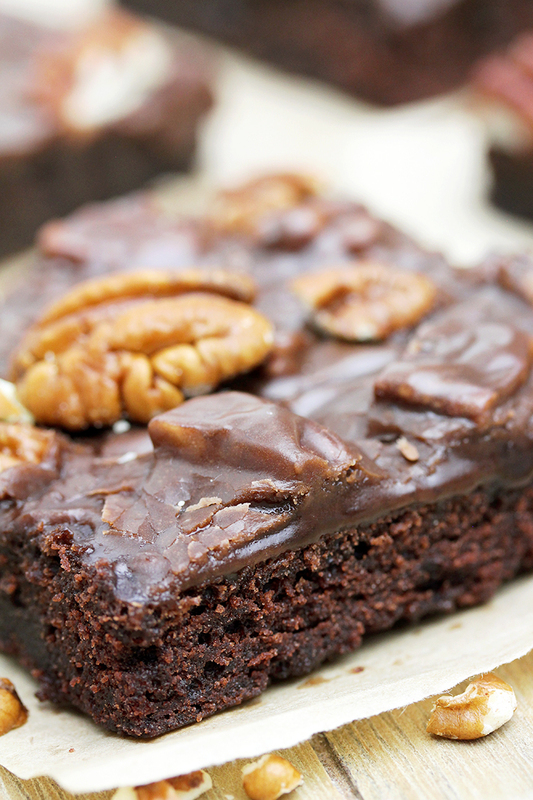 Texas Sheet Cake is thin, super moist chocolate cake, topped with warm chocolate frosting and pecans. If you prefer your chocolate cake not to be dry, this one is perfect for you – moist with chocolate fudge frosting. Sounds delicious, doesn’t it? It really is. 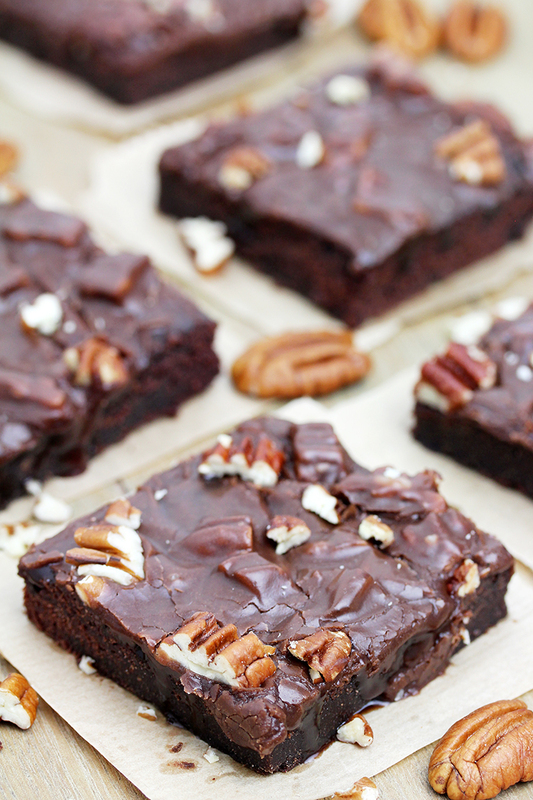 Texas Sheet Cake is perfect for big family gatherings and parties- there‘ll be enough for everybody. You‘ll get 24 pieces of pure chocolate perfection. It is made in 13 x 18 inch sheet pan. You can use two 9 x 13 inch baking pan as well, or even one 19 x 13 inch baking pan. If prepared in 19 x 13 inch baking pan, the cake will be thicker and baked 10 minutes longer. You can use 10 x 15 jelly roll pan, too, but bake it for 22 minutes in that case. For me, the best is 13 x 18 pan. 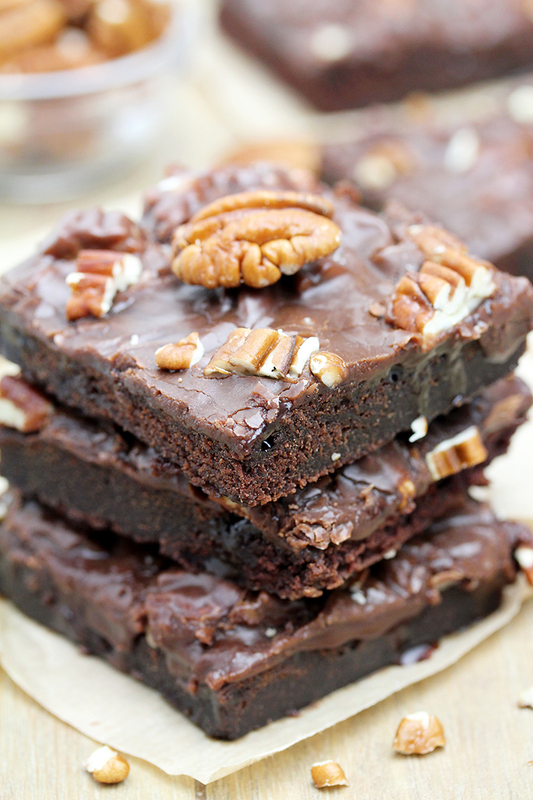 What I like about Texas Sheet Cake is that is very easy to prepare and you won‘t need mixer for it. There are many recipes for this cake and I‘m going to share my favorite. 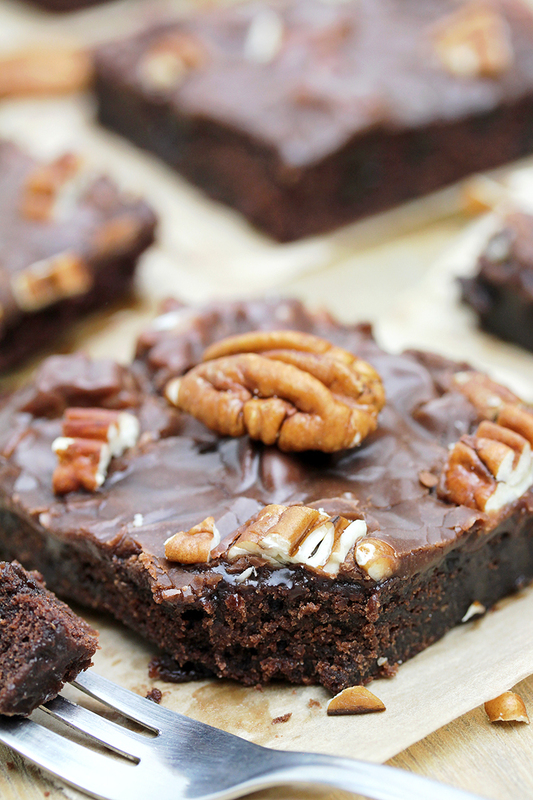 What do you need to make Texas Sheet Cake? 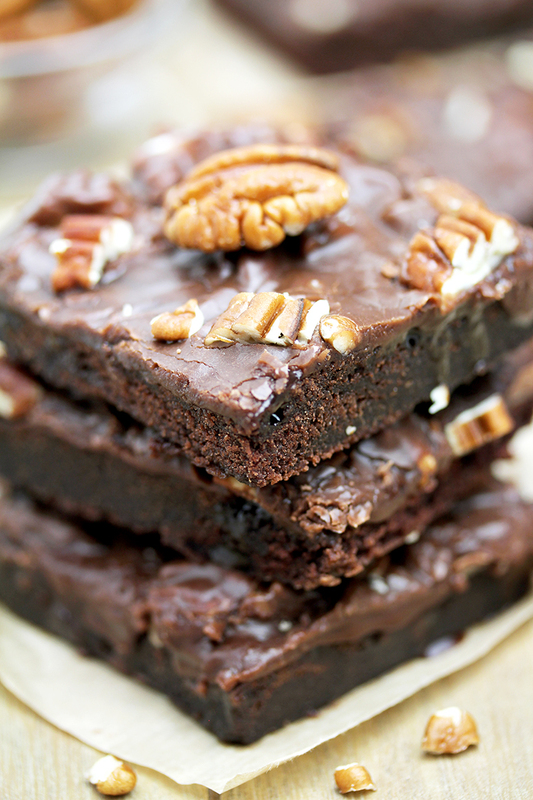 How to prepare Texas Sheet Cake? First, make a cake. Preheat the oven to 350 F. Line 13 x 18 sheet pan with parchment paper. In medium dish combine flour, granulated sugar, light brown sugar, baking soda and salt. In a smaller dish combine eggs, Greek yogurt and vanilla. In a big saucepan put butter, cocoa and water and bring to boil, at medium heat. Remove from heat. Add dry ingredients in the saucepan. Whisk until all ingredients are combined. Add eggs and Greek yogurt mixture and whisk until well combined. Put the batter in the sheet pan and bake for 20 min. Meanwhile, prepare the ingredients for chocolate frosting, about 5 minutes before the cake is done. In a big saucepan combine butter and cocoa and stir at medium heat, until well combined. Bring to boil, stirring from time to time. Remove from heat, add milk and vanilla and whisk. Whisk in powdered sugar. Add ½ of the pecans and stir. Take the cake out of the oven and leave to cool for a couple of minutes. Pour prepared chocolate frosting and spread over the cake. Sprinkle with the rest of the pecans. Let the cake cool and frosting to form before serving. Well, as you can see it‘s not difficult to prepare Texas Sheet Cake. You don‘t need a lot of experience in making cakes for Texas Sheet Cake to be success. Chocolate fans check out our most popular CHOCOLATE RECIPES. Visit our DESSERT PAGE if you like sweets. Chocolate fans get busy and surprise your loved ones with this perfect chocolate dessert. Enjoy! 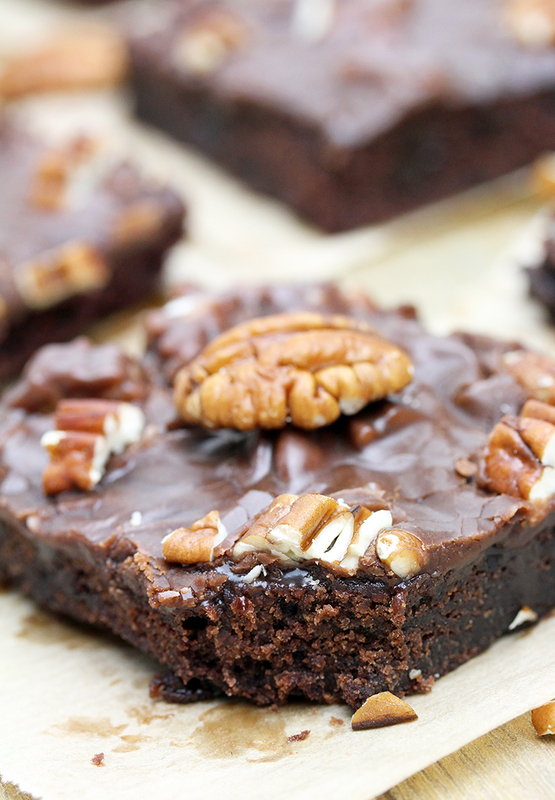 Texas Chocolate Sheet Cake is thin, super moist chocolate cake, topped with warm chocolate frosting and pecans. Preheat the oven to 350 F. Line 13 x 18 sheet pan or two 9 x 13 Inc pans with parchment paper. In medium dish combine flour, granulated sugar, light brown sugar, baking soda and salt. Set aside. In a smaller dish combine eggs, Greek yogurt and vanilla. Set aside. In a big saucepan put butter, cocoa and water and bring to boil, at medium heat, stirring from time to time. Remove from heat. Add dry ingredients in the saucepan. Whisk until well combined. Add eggs and Greek yogurt mixture and whisk until combined. Put the batter in the sheet pan and bake for 20-22 min or until the edges of the cake are coming away from the sides of the pan. Take out of the oven and let cool for 10 minutes. In a big saucepan combine butter and cocoa and stir at medium heat, until well combined. Bring to boil, stirring from time to time. Remove from heat, add milk and vanilla and whisk. Whisk in powdered sugar. Add ½ of the pecans and stir. Pour warm frosting and spread over the warm cake. Sprinkle with the rest of the pecans. Let the cake cool and frosting to form before serving. This recipe is close to mine but I use buttermilk and also some cinnamon. I like the idea of yogurt instead of buttermilk.